A crown is a covering that goes completely around a tooth. They can be made from various materials but usually from pure porcelain that is fused to a metal substructure, often gold or from porcelain only. Crowns are used to support a tooth and decrease the tooth’s chances of fracturing. This is especially true when a tooth has been heavily filled or root filled and the remaining tooth is weak or there is not enough tooth structure left to hold in a filling. Crowns are also used for aesthetic reasons when we need to change the shape or colour of a tooth. The length of time it takes to prepare a tooth for a crown depends on the difficulty of the situation. Usually a minimum of one hour is required in the dental chair. An impression (mould) is taken of the prepared tooth and sent to a Dental Technician who takes approximately two weeks to construct the crown. A temporary crown is made of plastic and is placed on the tooth for this time, so that you can eat properly and the tooth looks normal. 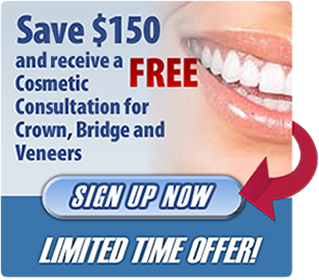 It takes approximately 30 minutes to cement in the new crown on the next visit. Generally a crown fails not because there is something wrong with the crown, but usually due to decay in the tooth around the crown or the rest of the mouth changes (such as teeth get darker, but crown stays the same) and this makes the crown stand out or the gum recedes around the crown. Depending on the situation a crown should last for approximately ten years, if the supporting tooth stays healthy. 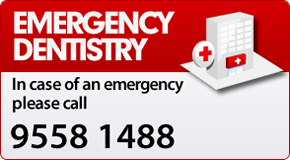 It is important though that you maintain regular dental check ups over this time, because if something starts going wrong with the crown it can more easily be corrected at an early stage. Porcelain veneers are used to whiten the colour of a tooth and/or change the shape of it. You can do one tooth or a segment of teeth to completely change the way you smile. These photos illustrate the before and after treatment of a patient having porcelain veneers. The before picture shows that the two big front teeth were OK, but the lateral incisor teeth and canine teeth were in slightly the wrong position and their size and shape were not quite right. The after picture shows a beautiful white smile. This patient had three months of orthodontic treatment on his upper front six teeth to get them into a better position followed by porcelain veneers on his canine teeth and lateral incisors (the central incisors were untouched).